Adhesion Promoter Helps Paint Stick To Plastic. Bonds with rigid and flexible plastic surfaces. Provides a smooth, even surface for paint. Flexible, so paint won't flake off of bumper covers and other flexible surfaces. Can also be used on other hard to paint surfaces, including glass, chrome and aluminum. Specially engineered to work exclusively with AutomotiveTouchup Base Coat. Most modern cars are made up of large, flexible plastic body parts. Parts like bumper covers, spoilers, filler panels and rocker covers are designed to bend and flex slightly without breaking. This flexing requires a special primer to keep the paint from flaking off. AutomotiveTouchup Adhesion Promoter is specially designed to keep paint on flexible parts. 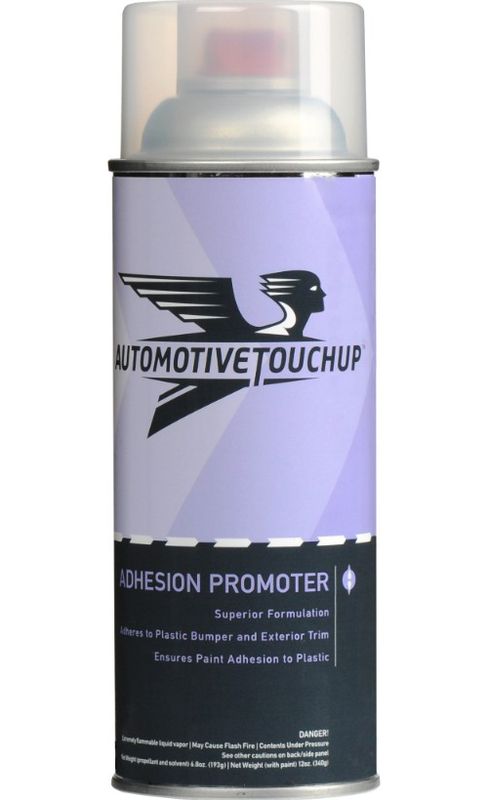 AutomotiveTouchup Adhesion Promoter provides a smooth, stable base for primers, base coats and clear coat finishes. It is especially formulated for use with AutomotiveTouchup paint products. For your best finish on hard to paint parts, be sure to use AutomotiveTouchup Adhesion Promoter.